Casa DIAMA, is located in the heart of La Geria. Built on the ashes of the 18th century eruption, it is a spectacular place to enjoy this wonderful environment. Casa DIAMA offers accommodation with all the stars of nature. We are a family company identified with its surroundings, faithful to a style and a vocation of more than 15 years. Attending to new demands, market trends and the needs of our customers. Your satisfaction and well-being are our priority. Casa Diama is located in a beautiful valley, between the mountains of DIAMA and EL CHUPADERO, 450 meters above sea level, in the beautiful and emblematic Protected Landscape of La Geria, an area where vines grow on volcanic ash. 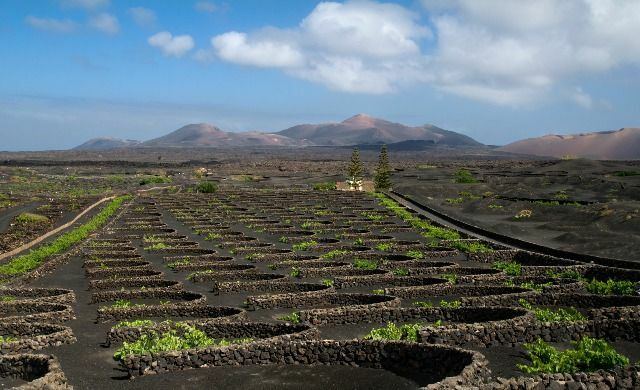 The farm of 21,000 m2, bounded on the west by the Timanfaya National Park and from it you can see the sea and an extraordinary view of the volcanoes in a privileged natural area. - The accommodation is located on a 21,000 m2 wine estate in the heart of La Geria. - Casa DIAMA is composed of two double bedrooms and a bathroom. The first one has a double king-size bed and a built-in wardrobe. The second has two single beds. - Both have windows to the outside. In the hall there is a built-in wardrobe to store towels and other household items. - The living room has a masonry sofa and fireplace. Dining table for six people and dresser. The kitchen is joined to the dining room by an arch of red edges. The kitchen is fully equipped, satellite TV and DVD, stove, large sun terrace, swimming pool. Cradle available. - All rooms have doors and windows facing outside. - The service includes cleaning, change of towels and sheets once a week. However, towels and sheets are always available. - Pets Allowed. - Diama apartment, totally independent, one bedroom with a double bed, bathroom, living room-kitchen and terrace. Satellite TV and DVD, stove, pool. Cradle available. - The service includes cleaning, change of towels and sheets once a week. However, towels and sheets are always available. - Pets Allowed.